I never thought that this drama would bring me and my drama watching experience into a whole new level. At least, when I first started to notice the drama, there’s an unknown force that made me took the opportunity to find out about the drama. Of course, that time, two months back, the information about it was almost scarce, except that it stars Ji Hyun-Woo and Yoo In-Na. Heck, I didn’t even know much about the lead actor except that he was recently in Mr Idol and one of the Hyun-Woos among the Korean actors who showed up when I was searching for the other two Hyun-Woos. It’s totally different for Yoo In-Na, since I’ve been following her career since Secret Garden. She’s the reason why I decided to give it a try, to see how she’s going to portray a celebrity after she did it for The Greatest Love. So I watched the first episode and I was oddly drawn to it. Everything seemed to be…I don’t know how to describe it. Perfect, maybe? I am a fan of sageuk and it somehow soothed my yearning for sageuk. Although there were quite a number of conversations in the first episode, I was able to catch the gist of the topics the characters were talking about, although it took me three or four times of watching the episode. Don’t even mention about the subs, I was elated to see it at darksmurf but there’s probability that it would never be completed, like what happened to the cable dramas. I was wondering, will it be the same? Would people notice this drama? And the attention crawled in. Queen Inhyun’s Man came at the right time when people were almost tired of Rooftop Prince for the endless scheming. I did see some complaining that Queen Inhyun’s Man was just another time travel drama and even worse, some even accused that it’s trying to ride the popularity of the other drama. Oh my. People could be so shallow at times, but the same group was also the same group of people who jumped into the Queen’s ship after realizing that ‘it’s totally different and better than Rooftop Prince!’ Don’t shoot me; I was not the one who said that. So the drama got more popular, episode by episode. The effect could be seen everywhere. Bloggers were praising the drama endlessly. Tumblr tags for the drama even got several variations. Even the production team realized this and they started to update the official website with the latest behind the scene stills after bring left without any update for about a month (as far as I remembered). I was happy for the immense popularity of the drama but I started to worry about something. ‘What if the drama got bashed?”Yes, I am that kind of person who is protective of what I love. I really hate to see people over-criticizing some dramas, just because they didn’t like the dramas. I know, there are some bad dramas that deserve the extreme critics, but you can’t possibly point out each and every flaw or bad side of the dramas. One thing I always have in mind when I watch any drama: it comes from human beings and hence, it can never be perfect. Dramas are like feelings – there will be times when they undergo ‘bad mood’. Maybe I ‘m just easily convinced and forgiving, but that is what I am. Back to the topic. The popularity did bring in immense number of fans and thus, the ‘war’ begun. Love could also brought along possible hate. And the effect of having more fans showed up in no time. Some scenes and development felt okay to me, but to others there would always be complaints, saying ‘it’s not right!’ ‘why? ?’ ‘damn the writer and director!’ etc. Yes, I admit that we all have different taste, but I just couldn’t understand it. But it’s an impossible thing to please all at one time. There would always be some who would have some issues.Episodes 11 and 12 was quite hard for me to take in at first since I got tired of the immense criticism. I felt a slight anger, asking myself why I was troubled so much about this drama. Maybe it’s just my bad mood, because episode 13 made me watch the previous episodes again and I began to appreciate them more. I secretly made a vow to myself: to try to accept whatever kind of ending the writer’s going to give me, because she knew the best. After all, it’s her story; not mine, yours, or even ours. Yes, I like to think positively and look at things from the positive side. Like everyone else, I didn’t expect to be able to guess the ending. Wow…even at episode 15, I couldn’t see what the ending would be. I was too focused to be sad that the drama was coming to the end rather than the ending itself. If not, why would I spend my evening crying while looking at the behind the scene stills while everyone else was dreading the ending? Actually..I was thinking about the reaction. Wow. That would probably the biggest concern of the writer (if she did care about the reaction) and I was hoping that she would stick to her initial plan for the ending till the final mark. Whatever it’s going to be, there would be complaints. That’s something inevitable. As I foresaw..some loved it..some hated it..to the extent of finding faults at everything. Yikes. This is the ugly truth: it’s all praises when you love something but when you hate it, the curses pour out? Humans. Forgive me, but for this once I want to be honest with myself and everyone. Yes, I am okay with the ending. In fact, when Boong-Do appeared in front of Hee-Jin, I was praying so hard it’s not a dream or illusion or imagination or anything that’s not himself, including his ghost. Ha. I did have that thought, but luckily he’s real. Phew. Thank you kdrama gods.So…the ending felt surreal? Impossible? Bear in mind that this is an imagination of the writer and a kdrama to begin with. There’s nothing impossible, even if the writer decided to give Boong-Do to the horse, which turns out to be a female who loves her master so much. Haha. Just kidding. So..I really feel the urge to share my take on the ending. Remember, it might not suit your taste and your take of the ending. Let’s start from the moment Boong-Do vanished from the jail and traveled to the future for the last time (hopefully). He was thinking about the promise he made with King Sukjong not to appear in front of His Majesty or anyone in the past again. Hence, he decided to commit suicide before he’s brought to the Uigeumbu officer who knew him. The act of loyalty, expected from a scholar like him. No wonder the king was so fond of him to address him like a dear friend. This time, his decision of killing himself was ultimate: he couldn’t do anything anymore for his promising life at the other side of the world which was already unreachable for him. From his side, there’s no other way for him to escape the mess he accidentally created as he avenged the death of Yun-Wol. He could do nothing but wait, as the talisman that brought him here and there was no longer effective. Thus, here came the magical phone call from Hee-Jin. Oh hi, ringing phone that suddenly rang in Joseon Dynasty. Guess SK Telecom made it possible over there? Right now, I’d like to put the phones and the talisman at the same level. Sounds absurd, right? Now tell me which part of this drama is based on the law of logic? Only a few. For me, the talisman was the power of Yun-Wol’s love. Her humble wish for Boong-Do to stay safe from any harm was the ‘power’ that made the talisman work including the blessing from the higher power. Thus, when the owner of the power died, the power was exhausted and the talisman could never work properly again. Like what had been been illustrated, it ‘died’ along worth the power that drove it to work. Hence, where’s the proof of Hee-Jin’s love? Wasn’t her love powerful enough to protect Boong-Do like Yun-Wol did? Sure, love cannot be seen or measured, but this is a kdrama, where some things have to be visually shown to the viewers for them to get the meaning. And the only possible thing that could tie Boong-Do and Hee-Jin was the phone. 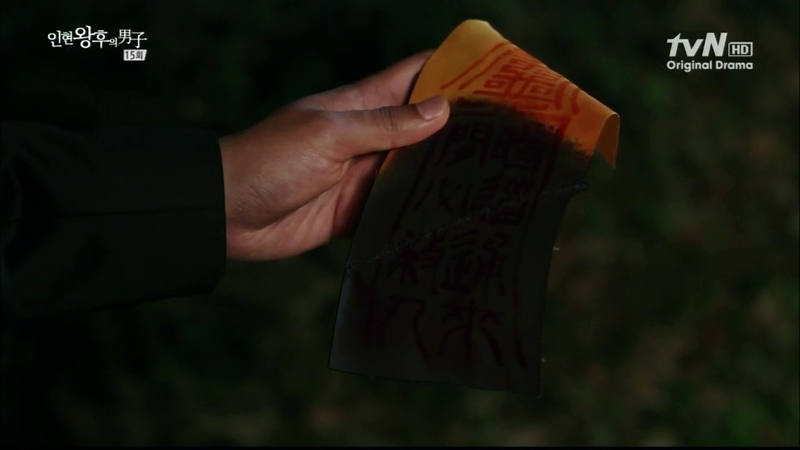 The phone is the like the physical representation of Hee-Jin’s love for Boong-Do, like the talisman for Yun-Wol. Then comes the next question: why the phone? Not the necktie or the suit? Remember the third episode, when the talisman was being switched with Hee-Jin’s phone? That very phone was also the reason why they could meet again. Should I recall everything about the magical phone of Hee-Jin? Episode 1: Hee-Jin got the call from the director about her casting, thus enabled her to meet Boong-Do when she paid a visit to the filming site at the palace. Episode 4: Boong-Do remembered her phone number (shown in episode 6 in flashback). Episode 5: She got connected to Boong-Do and got to know about his situation through that phone. Episode 10: He contacted her but it was Soo-Kyung who answered it. Episode 12: Through the phone, Boong-Do made his promise to take responsibility. Episode 13: It’s Hee-Jin’s phone that saved his life and with his phone, it created a connection between the phones and also the owner. Episode 15: Wondering why Boong-Do still spoke through the phone? Yes, it’s the thing that can connect them. Anyhow, another point to ponder: if Yun-Wol could ‘send’ Boong-Do to the future, why couldn’t Hee-Jin ‘summon’ him to the future? Suddenly, I saw the reason why the writer decided to kill Yun-Wol although I was hoping for a happy ending for her. 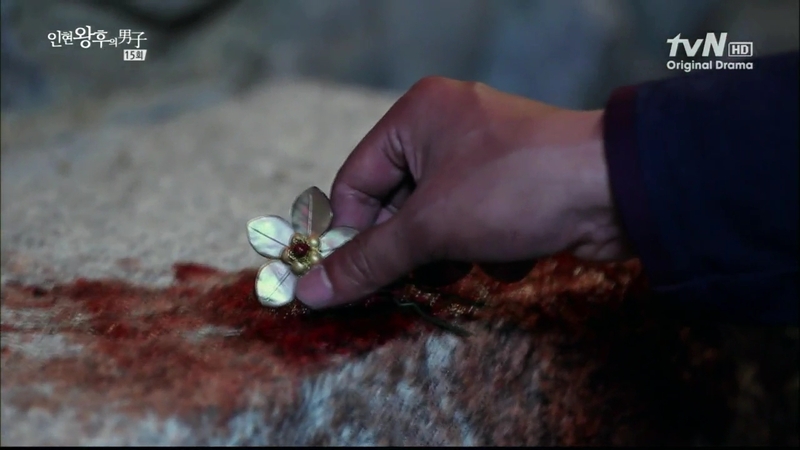 Besides giving Boong-Do the reason to kill Ja-soo, I believe that the writer wanted to show that both Yun-Wol and Hee-Jin loved Boong-Do almost at the same level, if not equal. If before this, the talisman (Yun-Wol) protected him in the past, but now it’s the phone (Hee-Jin)’s turn to protect him both in the past and in the future. I’m also sure that it’s part of the undying wish from Yun-Wol for Boong-Do not to die for her sake and she definitely had some shares in the event that led him to be caught and possibly being recognized by people. I still can’t believe that it has come to its end. Probably that’s the reason I had a dream about the preview of episode 17. Can I move on in this state? Probably yes, but not completely. The effect of having watched such a good drama makes it harder for me to watch any dramas for the time being. I will go “Oh, such a screechy voice. Lucky Queen Inhyun’s Man didn’t have a character like this!’ or “So annoying. Can’t I just get someone like Boong-Do?” or “Hee-Jin won’t do something like this…” The bar is already set so high for me and I am hoping that I can avoid comparing other dramas with this one. It’s not the same, right, I know, so I might have to take a breather from all this drama watching. I’ll continue to watch when the standard is not marred anymore by Queen Inhyun’s Man so that I can enjoy dramas without excessive expectation. Is this the time to bid goodbye? At least not to the OTP. Ji Hyun-Woo confessed to Yoo In- Na after the final episode screening. Wow..that’s so brave and courageous, but also suicidal as well. She didn’t give any response yet and needed to have a talk about this matter with him. Hehehe. People were speculating whether it’s just a publicity stunt, but it’s not that easy to do that, right? He will be criticized if it turns out to be total publicity stunt. Also, some thought that maybe it had to do with the ending. Just to make up for the unsatisfying ending for everyone, he mustered up the courage to confess, just to save the drama? Oh, what a courage he had just for the sake of the drama? My take is he’s sincere about his feelings and that was the last opportunity for him to tell her about it. He’s going to enlist soon (sobs) and maybe…he wants his heart to be known~ Haha! I am wishing for the best for both of them and I believe this is not a joke, since they’re both adults and he knows better what the effects are he’s just putting up a show. Talking about them…what I loved the most during the final scene wasn’t the kiss but the moment when Boong-Do blinked a long blink, assuring that it’s all has came to an end and she blinked back, expressing her agreement. Talking with the eyes is indeed romantic! It’s the best when you say nothing at all…let the eyes do the talking! Even Boong-Do doesn’t want to believe it’s already ended! *I’ll come back to this when I’m completely sober. This lack of sleep is making me tipsy. i love this drama… heheh i hope, they will be real couple.. hahha..
script writer is daebak.. hahha.. can make me cry, make me laugh, i love this couple.. The phone! The phone! Why can’t that be the connection to bring Boong Do back?!! I totally agree with your assessment. You are so right about how now all other dramas pale in comparison to QIHM especially romances. I’m finding I am more interested in melodramas where the romance is not the main focus (Ghost, Sign, Bridal Mask) than others (I Do I Do). Even AGD and Dr Jin, I like but not invested in either. QIHM, I was invested. I have not seen the last 2 episodes as I am waiting for the eng subs but I have read the recaps, thoughts of those who have. I have cried just reading them. I cannot even imagine what will happen when I do watch them. I have turned a couple people on to QIHM and they have become super enamored with it as I have. I loved King 2Hearts and thought I would be watching it over and over again. Nope, QIHM has been my repeat drama. Like you said, before seeing it, I thought the premise would be like RTP but it only took one episode to see that it was not, and even better. I loved Ji Hyun-Woo in ATK, just hated the drama. I liked Yoo In-Na in Secret Garden and Greatest Love. But for them to hopefully become a couple for real as we, the fans got to see their romance grow, here’s hoping!!! Sometimes..it’s just the matter of how we can accept what the writer gives us…hehehe. I don’t think I can watch dramas the same way again. QIHM will be at the back of my mind, gnawing at each and every drama I’m trying to watch and it will make me compare everything with it. JULY!?? Ok, my true love comes back to drama in July (Lee Joon Ki) and my new love goes in. There is no justice in drama!! Here’s hoping! Love LJK (totally) and Shin Min-A! Right now I am just watching dramas, I’m not heavily invested in any. A drama watching after my own heart. Yes, AGD is the one I actually like! And of course have to watch Nice Guy! Isn’t that going to be a serious melodrama too?! Can I express my fears as its the writers that gave us Sorry I love You?!! I heard that he confessed because they are dating and wanted some public way of easing the relationship, and what better than a romantic declaration in front of their most ardent supporters? I loved the ending.I don’t know about the phone theory – I kinda thought it was because all the other times he risked death, he always knew (or hoped) the talisman would save him but the final time, he did it without any ulterior motives. But I loved, loved, loved this drama. Oh – and WithS2 just came out with subs for the 1st episode so even if darksmurf never finishes, we will get complete subs eventually. Hmmm I’m going to have to check this drama out. I think they are such a cute couple on and off screen if she is as invested in him as he is to her. I hope she is brave enough as he is to do so to admit it. All I read are people who ship them in REAL life….don’t see what is the issue with their company to try to hide or deny it. Neither of them are YOUNG. I’ve just jumped on to the QIHM ship, in fact merely three days ago, having been introduced to this show by my mum. (Hahahaha) I marathoned it in 3 days and oh my, this show is fantastic. I’m not going to clog up the comment heh and shall move on to rant on TR, but anyway just want to say that well done for the post up there! I totally agree with you on each point and that the phone has now taken over the place of the talisman. Hahaha I understand that feeling 😉 Any mention about them and I’ll smile happily. Such a good memory of 2012!